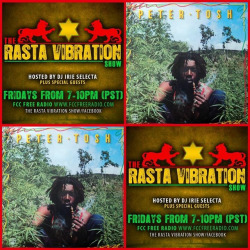 Be sure and tune into The Rasta Vibration Show! Tonight we have nuff reggae music to get you wigglin & jigglin! Roots, Lovers rock, Dancehall!!!! Plus we have tickets to give away to see Elephant Man live at New Karibbean City!!!! Tune inn 7-10pm(pst) worldwide on www.fccfreeradio.com Studio 1A Tell a friend to tell a friend!! !